I am fascinated by how people find creative and innovative ways to help others - the logistics of solving a problem and showing compassion. A perfect example of this is GIVETOKENS.org which is based in Portland, Oregon. In just about any group conversation I've had about giving money to the homeless, there seem to be a couple of different ways of approaching the issue. The one I subscribe to is that it's good to give freely and how they will spend the money is up to that person. However, some hesitate to give to people on the streets for fear that the money will go toward funding an addiction of some kind. If this hesitation or concern is the only thing that is keeping you from giving to those who you pass by on the streets, this is the perfect solution. If you've never been homeless, it can be hard to imagine how much stress and crisis is involved in just trying to do everyday, ordinary things. There are many homeless people who have jobs, but worry about how they're going to wash their next load of laundry to be ready for the next work day. 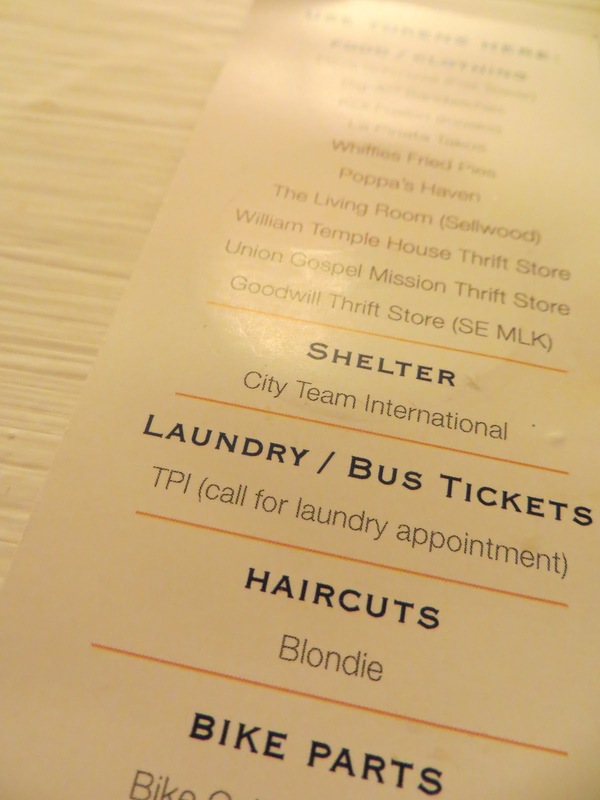 Many homeless people are looking for jobs, but figuring out how to get their next haircut may be yet another enormous challenge. While there are (limited) resources available, like temporary shelters, the crisis for a homeless person is paying for the transportation to get there. 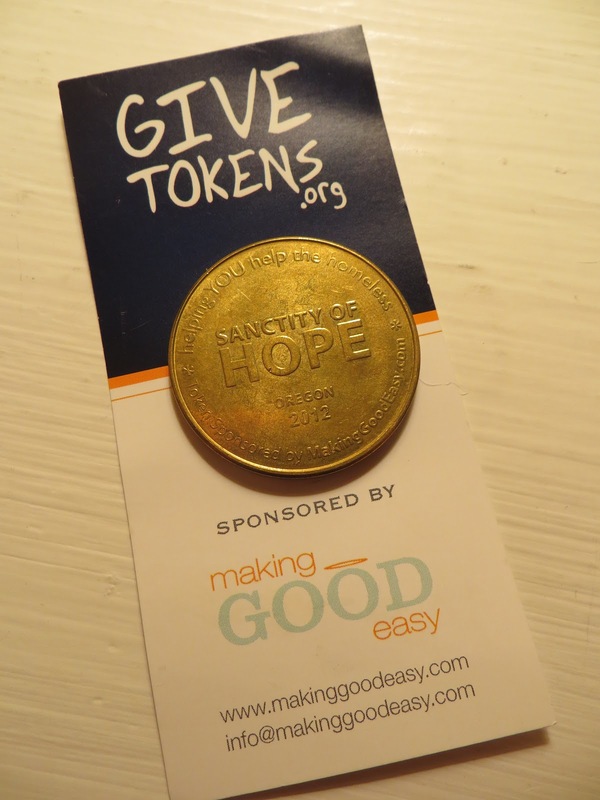 The tokens from GIVETOKENS.org are specifically redeemable for food, clothing, shelter, haircuts, transportation, and other practical necessities. I got this at Poppa's Coffee Haven, where they make the coins available for purchase, and also accept them as payment so someone can get in from the cold for a cup of coffee or hot chocolate to warm up their hands and heart. The concept is that you give the card with the coin attached so that the recipient can read the list of places on the back where it can be redeemed. While this is Portland-based, I am excited to find out if this is, or will be, available in other cities as well. Individual businesses can decide on what the value of the token will be when used at their business. 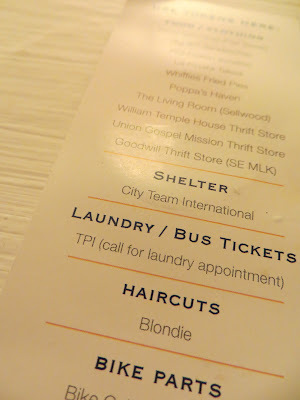 The back of the card lists some of the businesses that accept the tokens, and if you go online, you will see even more. 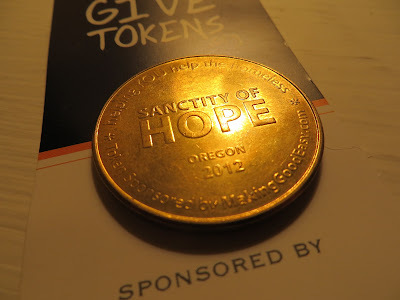 Travis Vanstaaveren, a Gen Xer, is the creator of Sanctity of Hope and the branch of the organization called GIVETOKENS.org. His studies in business at OSU, as well as his studies in philosophy and theology at Marylhurst University, were the perfect combination of bringing together logistical business solutions for a pressing ethical issue in our society. This is innovation and compassion coming together in a profound way. Every time I turn around, I see yet another Gen Xer doing extraordinary things for the world. When I was in high school, I would sometimes attach a black and white photo I'd taken to a sheet of paper in a spiral notebook with some words written below it and pass it around to friends between classes for their comments. It was a sort of 20th century form of pre-blogging. It involved the potent-smelling chemicals I used in the dark room, the dark blue ink I used to write the words, the glue I used to attach the photo and bits of spiral notebook paper pieces that would fall to the floor like snowflakes when I would rip a page out of the notebook. The whole process was all very un-digital. I spent many of my high school days in the dark room. As an introvert, I loved the safe, dark space. I loved the comforting ritual of developing a picture and then attaching it to a piece of string like a clothes line over the sink so the chemicals could drip off. I spent many of my high school days in art classes - creating collages or paintings, but ultimately there was no place for my art to really go except maybe on a shelf to collect dust. And it is difficult to put hours of work and heart into a piece and know that it will probably never really be appreciated. In those days, when I would get up the nerve to submit a piece of my writing to a magazine, it was usually ignored or denied. I wasn't really sure what potential my photography or other art had either - a lot of it was mediocre and I wasn't sure how to truly improve. But people knew me as a storyteller, and they were always asking me to tell stories. So I would tell my stories. And I waited. Sometimes I would share my writing ideas with people and they would tell me I wasn't good enough. Other people told me I had talent. So I lived my life, and went to school, and worked, and all the while I was punching my timecards into timeclocks, the internet changed the world and bloggers started launching their words and art from their digital platforms. People began making waves in the world in ways that were not previously possible, and finally I realized I could do the same. And while I waited, digital photography became available to the masses which meant there was a way for me to finally be the photographer I had always wanted to be. As I began to blog and to be a storyteller to a larger audience, I would always think back to the place where I first remember hearing stories - a church where the preschool teachers would tell us stories on a flannel graph in the quiet space of the church sanctuary with most of the lights off and sun streaming through stained glass - that sanctuary was peaceful to me in my childhood years like the darkroom was peaceful to me in my adolescence. And this is part of why I bring this all together for others - to help others find a peaceful place of their own or a peaceful moment of resonance, and that is why you will see a sort of flannel graph style background in a lot of my photography. It's interesting how in that sanctuary that was mostly dark and how in the dark room I felt such a closeness to God and it is interesting how His light comes to us in the darkest of places. If the art is in you, if the truth is in you, if some unrecognized talent is in you, hold on just a little longer, because if the form of media or platform does not yet exist for you to create on, it will probably be here soon. Of all the millions of apps that exist now and all the ways we can connect with each other it is astounding to think of what is and will be possible. We no longer have to create something only to have it placed up on a shelf. We are now in an age where the Pope leans over and takes a blessing first from the people, we are in an age where the gatekeepers no longer have all the power and we are not longer at the mercy of the denial letters in our mailboxes. We are in an age where we can create art or write, and with the push of a button, we are published. And because of the voice of the masses, truth can become manifest in a way that it never was before, and countries and regions can organize revolutions based on social media. 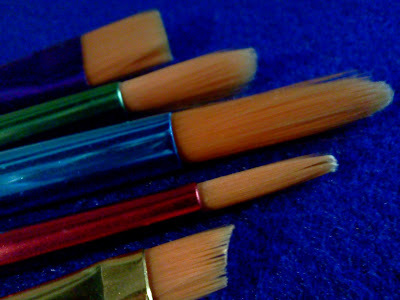 Now nothing, and no one can stop your art and your heart from going out into the world. If you have not yet found that thing that truly inspires you and that truly allows you to create and to be truly you - just wait a little longer, we are in a time and place where new things become possible every day that did not exist the day before - hold on a little longer because there will be a platform for you and the gifts you were born with. That thing, your thing, will come. Project1979 is about giving a generation of 30-somethings a voice - to allow us to tell our story. Those currently in their 30s are either from Generation X (younger, second wave Gen Xers) or from Generation Y. "This project is an evolving collaborative storytelling project, designing an occasion for people to belong to something greater than themselves. It is developing a collective experience which focuses on what 30-somethings have in common, what inspires us, what has influenced our differences, what brings us together and how we belong to a generation that is neither X nor Y. The goal is to connect a generation, to focus on what we are doing right." Her line above about us being neither X nor Y really strikes me. As a 37-year-old, I am in the same decade of life as Gen Y people who are in their earlier 30s which means we have a lot in common. While being Gen X defines me in many ways, it is a good reminder that there are always ways for us to reach out to and connect to those around us regardless of their generation. Alice Venessa Bever is the creator of Project1979. She is a performer, director and educator, but that would probably only begin to describe her. I'll also add that I think she is about 79 different kinds of amazing. As a 30-something, she encourages you to tell your story as "you probably have something quite awesome to add." This is a project I hope to be a part of sooner or later. Between social media, music, performance and even nostalgic wonders, this project is building bridges - connecting people all over the world. In one of the Project1979 YouTube videos, Alice describes the project as "a totally rad experiment on the human experience."